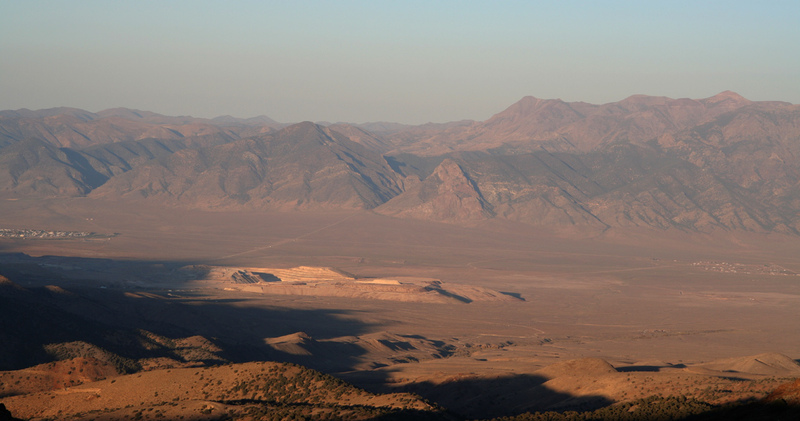 How to get there: A convenient point of reference is Tonopah along Hwy. 95 several hours north of Las Vegas. This is your last place with gas and shops. From Tonopah, head east on Hwy. 6 about 6 miles and locate Hwy. 376 that turns left (north). Go north for 13 miles where the road forks. Leave Hwy 376 and go north-east on the Belmont/Monitor Valley Road. This road has recently been upgraded, the road is wide with a good (newly?) paved surface. Belmont is a small place in the middle of nowhere, continue through town and staying on the (only) main road that now turns into a pretty nice dirt road, continue another 5 miles. Look for brown signs for a road that turns 90 degrees left, called Meadow Canyon Road. Turn onto this road and continue about 8 more miles. After about 3 miles on this road you pass an open gate with a cattle barrier, further up the canyon there is a road fork right in front of a ruin of an old building, take the main road straight ahead, that is on the right side of the ruin. Finally, you arrive at a spot where the road forks sharply left and right. Ordinary passenger cars should go right and park when convenient. 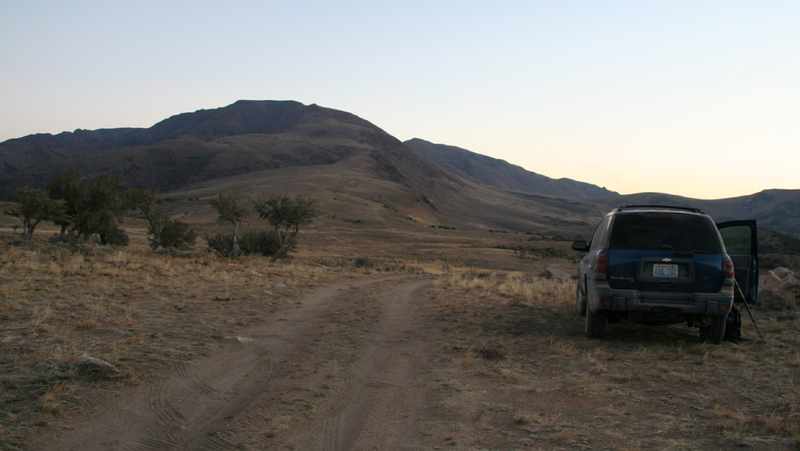 High clearance, 4WD vehicles should go left and continue for slightly more than a mile until reaching a broad saddle area called Jefferson summit. There is a small dirt road that forks right at this point, however, this is a fine point from which to start your hike. The elevation is 2675 meter and the location is N38:41.573, W116:56.404. Route description: From the trailhead described above, follow the old track of a 4WD more or less straight north towards the mountain. Initially, this route descends until reaching the lowest saddle. Continue along, there is a fence on your right side. As you see a hole/gate in this fence cross to the right side and continue along the jeep track. Eventually, these tracks end in the grassy slope at elevation 2854 meter, location N38:43.187, W116:55.834. You are now right next to the fence. Cross it easily (to its left side) and pick up a clear trail that ascends the slope while following the fence upwards. 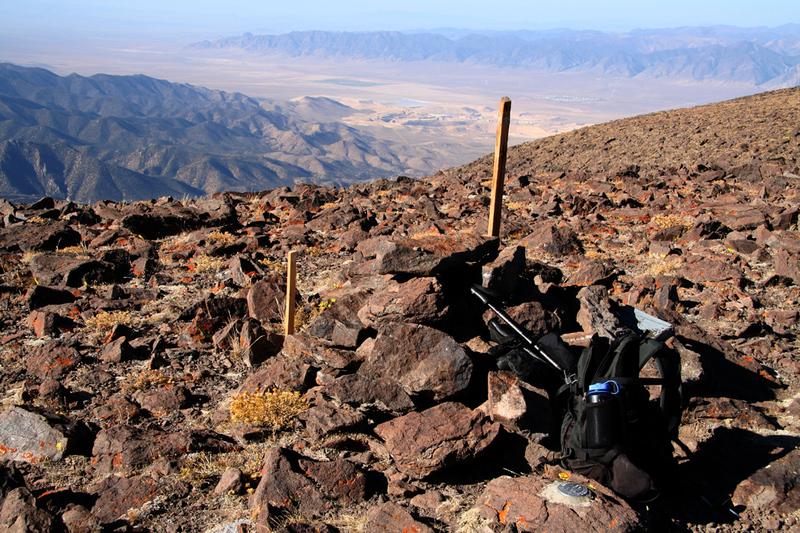 Higher up, on a somewhat more gentle slope, the trail becomes less visible, but there are more cairns showing the way. 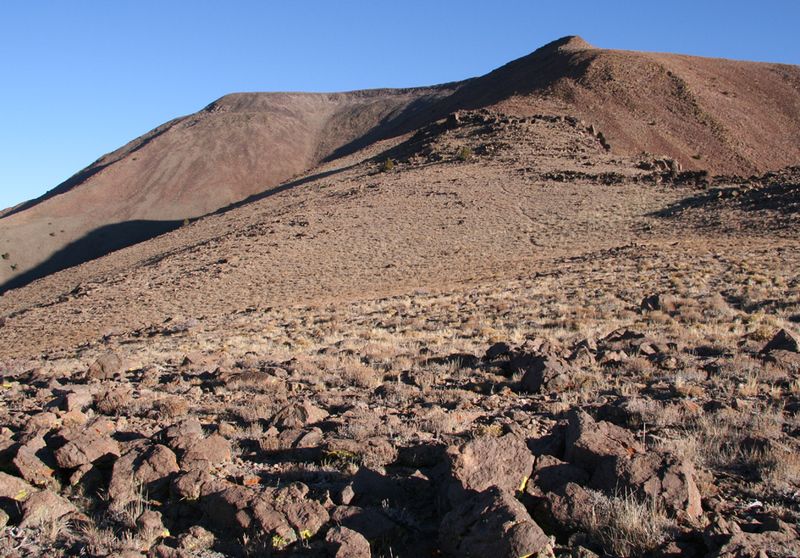 The route makes a long traverse to the left instead of climbing the hillside in front directly, look for the cairns as they ascend gently towards the left side. There is at least one big cairn where the trail bends right and climbs more distinctly, the trail is again easy to follow. Higher up, the trail enters a more gentle section and again becomes somewhat hard to follow. However, in case one looses the trail, proceed in the correct overall direction and you will soon enough pick it up again. The route heads towards the very pointed subpeak that one will see ahead. First, the trail actually climbs to a small saddle area before this pointed peak, next it follows an ascending line on the left side of the subpeak. Here, the sideways slope is somewhat steeper, but the trail is level and very distinct. After contouring on the left (west) side of the subpeak, the trail climbs to a small saddle between this peak and the main summit further ahead by way of a few zig-zags. From the saddle, the route climbs more east (right) and to the north side of the main summit. From here, a short trail forks left to gain the summit proper, while the main trail continues a traverse on the north side. 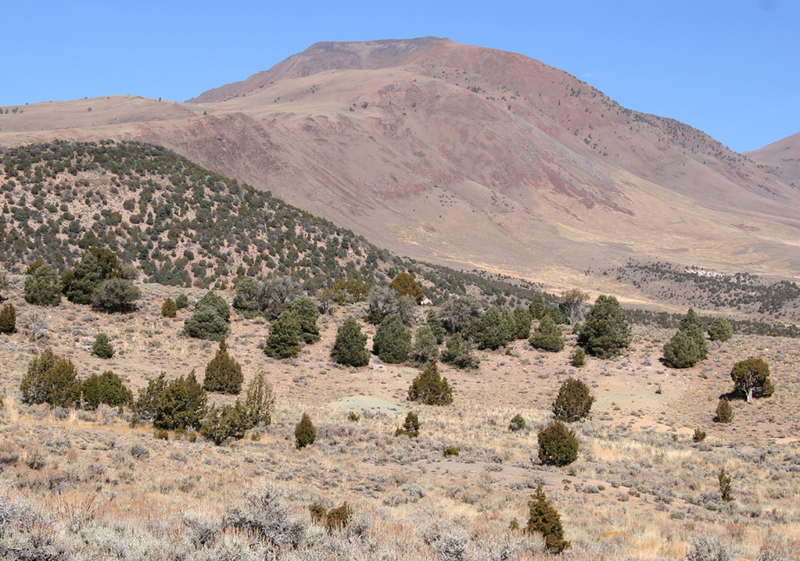 Proceed to find the very large and flat summit plateau with a few small structures serving an antenna. Comments: I started at sunrise, 0700. 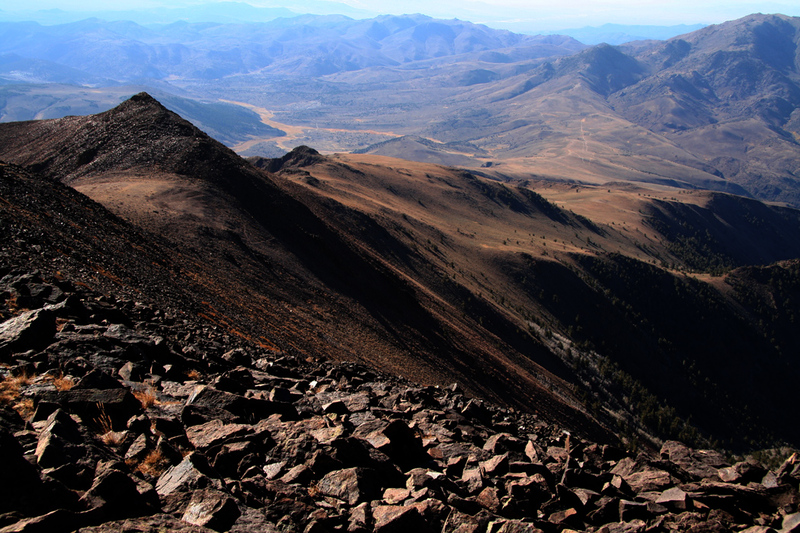 The summit was reached at 0930, this time included a photo-chase of a bighorn sheep as well as a search for my backpack. I left the summit at 1000 and returned to the car at 1130. A more detailed trip-report is available. My N5 trip continued to Arc Dome the following day. Jefferson Mountain, as seen from the Meadow Canyon. The trailhead, it is early morning. The mountain with a flat summit area, is right ahead. The route heads straight up the broad ridge, then on the left side of the distinct, pointed subpeak before reaching the summit. Valley view, while hiking. This is the valley on the east side of the mountain range. The route, proceeds straight ahead. The route, as seen from above.